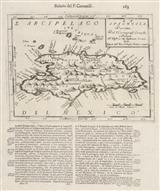 Description: Early copper-engraved map of Hispaniola, modern-day Haiti and Dominican Republic. One of the earliest available maps to focus on the island. Description: A hand coloured miniature map of Haiti and the Dominican Republic embellished with ships and monsters. Description: Very early map of Santo Domingo based on Spanish and French sources. Description: A striking and elegant sea chart with ornate cartouche. Fine engraving in black and white. Description: Hispaniola. French sea chart of Hispaniola, with elegant cartouche. Coloured. Description: Decorative bird's-eye view of St. Domingue, a French colony on the Carribean Island of Hispaniola (1659 - 1804). Coloured. Description: Coloured map of centring on Hispaniola but also detailing Jamaica and Puerto Rico. Description: Haiti and the Dominican Republic featuring curious border line between the French and Spanish sections of Hispaniola. Coloured. Description: Domincan Republic and Haiti. Shows the routes of P.L. Griwtonn. Original Colour. Description: Haiti, Hispaniola and St. Domingo. Original colour. Description: Haiti. Published in the year Haiti recognized and accepted the full independence of the Dominican Republic. Original colour.